CIGR Is a week-long artist residency. 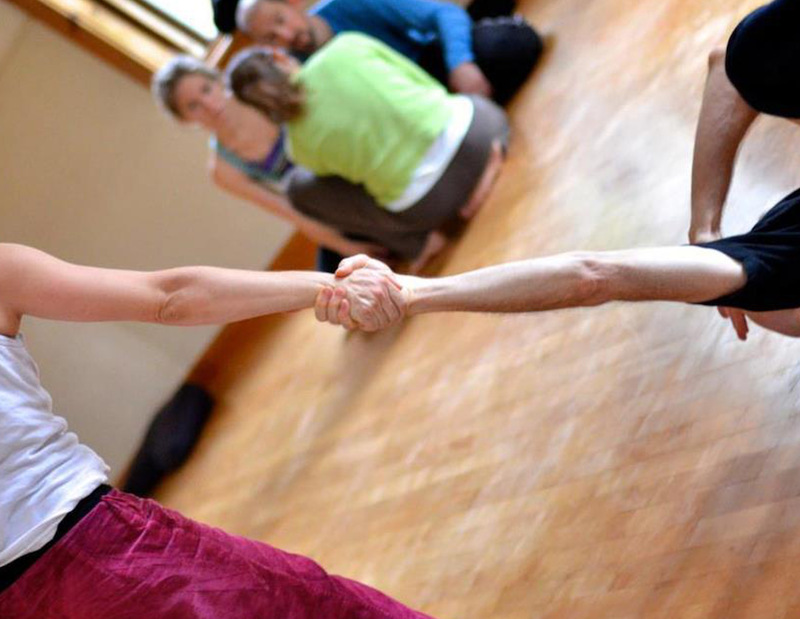 Advanced improvisation dancers share focused time together steeped in a physical research practice while actively engaging in CI's pedagogical questions. Through four days of self-directed research and inquiry within large and small group formats, as well as open jamming, participants deeply pursue the theme proposed by our Research Catalysts. CIGR culminates as part of Earthdance's Spring Equinox Jam where participants are invited to share the fruits of their research. It is important to the congruency and the safety of the group that all participants are truly confident at this level of practice. It is also important to note the assumptions of physicality in these criteria. We encourage physically challenged participants who are invested in CI to apply. Your reasons for wanting to participate in CIGR and your thoughts on this year's theme "Unraveling Normal"
Along with your application, please send a $75 deposit (fully refundable if you are not accepted) either by Paypal or check. Log into your account, click on “pay or send money” for “goods or services”, and send $75 deposit to paypal@cigroundresearch.com. Make a check out to "Aaron Brando" and send to 12 Cherry St, Northampton, MA 01060. This is an invitation to rigorously challenge ourselves to expand our awareness within and around the dance form we love. What is normal for you? What are the areas you don’t like to think about? Where do you draw the boundary between CI and something else? Why are we triggered, what is it that makes us feel protective? Let’s look at the places of discomfort, not turn away, allow the unfamiliarity of being with the questions to teach us. We are all tangled up in assumptions of ”normal,” the unspoken cultures around CI, the aesthetics, the duet form, the ways our dancing reflects the structures of oppression in our society, and the denial that enables those structures to still stand today. We are tangled up in our personal habits and patterns, and our habits and patterns around breaking those habits. Unraveling normal is an invitation to look at how we are inhibiting our vision of what is possible. We will be working with documenting our dances and our processes, in writing and wording the experiences from our bodies.